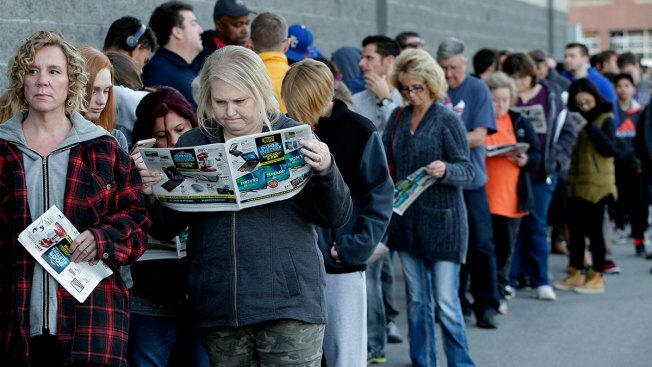 In this Nov. 23, 2017, file photo, people wait in line for a Best Buy store to open for a Black Friday sale on Thanksgiving Day, in Overland Park, Kan.
Black Friday is the most famous shopping day of the year, with millions of bargain-hungry shoppers flocking to stores to cash in on dramatic sales. And Black Friday 2018 will likely be bigger than ever, reports finder.com, which predicts that Americans will drop $90.14 billion. But that's not actually when the very best deals can be found. In fact, "technically, as a single day, Thanksgiving is better than Black Friday," says Lindsay Sakraida, the director of content marketing for Dealnews, a comparison shopping website. And Cyber Monday is a strong contender, too. That doesn't mean you should forget Black Friday altogether. As she told CNBC Make It in 2017, "Black Friday is still very strong, but a lot of the big deals are going to go live on Thanksgiving Day." The holiday is, "unfortunately, the better of the two days." Sure enough, Dealnews recently reported that "even though we posted the most deals on Black Friday itself in 2017, both Thanksgiving and Cyber Monday featured more Editors' Choice deals." More and more stores are even rolling out sales before Thanksgiving in an effort to get ahead of competitors, says Sakraida, who recommends checking for sales as early as the Monday before Thanksgiving. The smartest time to shop also depends on what you're looking for. In 2018, "Black Friday will likely be the best day to get deals on kitchen goods, clothes, tools, beauty products, toys, laptops and appliances," Dealnews reports. "But if you're looking for most types of electronics, Thanksgiving tends to have better deals. We're predicting Turkey Day will have the best deals on smartphones, speakers, tablets headphones and video games in 2018. "And if you want to buy a television or book your next vacation? Cyber Monday is probably the best time to shop." If you really want to maximize savings, you should continuously check for sales starting this week, as "the best sales could pop up at any time," the sites notes. Whether you're shopping on the week of Thanksgiving, Black Friday or Cyber Monday, you'll want to have a plan in place to avoid overspending. Start by determining exactly how much you can afford to part with. Once you have a budget in mind, do your research, says Sakraida: "Definitely do historical price research to get a quick assessment of whether or not the prices you're seeing are actually good." She recommends using camelcamelcamel, a free Amazon price tracker, or doing a Google search to get an idea of how different stores price various items. While you're at it, check out similar items or versions of whatever it is you're looking for, she says: "If you're dead set on one specific model, you may be blind to the other discounts that exist on very similar alternatives. Keeping an open mind and being a little bit flexible with what you end up buying, within reason, is definitely a good tactic." Finally, avoid impulse purchases. One of the biggest mistakes consumers make over Black Friday weekend, says Sakraida, "is buying things that they weren't planning on buying beforehand and that don't fit a specific need." If you discover a discount on something that you were planning on buying, great, but resist the temptation to buy things just because they're on sale. "The reason Black Friday exists is to bring you in with the really cheap, rock-bottom prices in the hopes that you do jump on those filler deals while you're there," says Sakraida. "Being really aware of that and trying to avoid that temptation is important."